My favorite lift kit for the Jeep Cherokee is part number ZX071866W from JC Whitney. This is a three inch lift that includes an extra leaf for the rear spring pack and a block. It also comes with new front springs. Click the link below and search for ZX071866W. The price is currently $120 but it varies from time to time. I have this kit installed on my 88 XJ with 33″ tires. I had to cut the fenders a bit to fit 33’s. Jenny has the same kit on her Jeep with 31″ tires. It is amazing that this kit comes with new front springs and an extra leaf for the rear andf blocks for the rear for just $120. Most lift springs alone cost more than this. 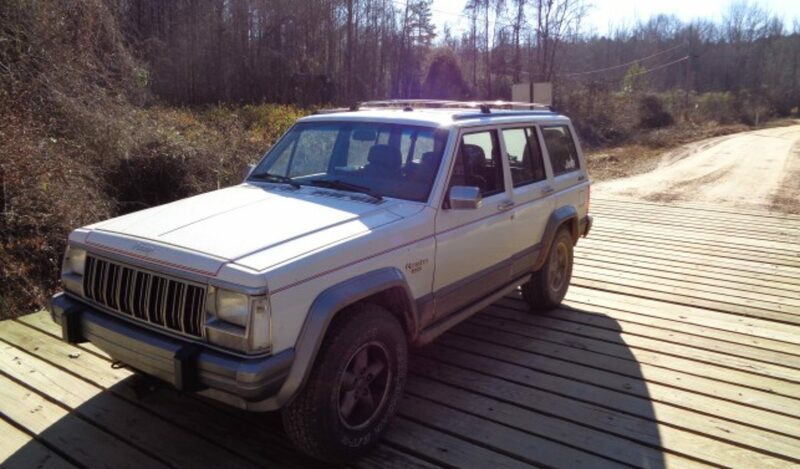 Will’s 1991 Jeep Cherokee 4.0 has been running poorly lately. It started dieing at traffic lights. We cleaned the idle air control valve several times. Each time we cleaned it, his Jeep would run fine for a while and them stall again. Naturally it would stall at an inopportune time. Eventually his Jeep got to where it would run rough all the time. I began pulling plug wires to isolate the bad cylinder. The number one cylinder was dead. It seemed that the injector simply was not firing. There was good spark, just not firing in the cylinder. Removing the plug wire did not change the engine speed at all. The plugs were nice and tan but very worn. We replaced them along with the wires to see if it would help. The engine ran smoother but there was still the dead cylinder. We posted the questions about the Code 27 that the engine computer was showing on a couple of bulletin boards. Both the XJ list and Hesco forums suggested that we test the injector before looking at the ECU. Code 27 indicates trouble with the injector firing circuit. The injector tested fine at bout 14 ohms. As I was showing Will what was involved in swapping out the ECU, we noticed the connector looked strange so I wiggled it around a bit. When Will restarted the Jeep it ran fine. Later we pulled the connector and sprayed some cleaner on the contacts. So far his Jeep continues to run great with no more stumble. Hopefully all his troubles were related to this simple bad connection at the ECU. On my off road Jeep, Scuffy, my favorite accessory are my Maxxis Buckshot tires. Having larger tires with a great tread pattern has really helped me go places that were never possible in my stock Jeep with BFG AT’s. My other most favorite Jeep accessories are my lockers. In the rear I have the Loc Rite in my 8.25. This locker is fully automatic. It is very tight and locks up very quickly. It is a little annoying on pavement and can be embarrassing when puling into a gas station or a tight parking space. It is interesting to note that I had this same axle in my street XJ for a while and it was very calm behind the automatic. However, with the manual of my off road truck, it pops and squeaks the tires. In the front, I have an ARB selectable locker. This is really cool in that I can hit a switch and choose between fully locked and fully open. I love being able to walk up to a rock and then throw the switch and then be able to climb up on it. The indispensable accessory is my winch. I don’t use my winch much but it is really nice knowing that it is there and ready to rescue me if I need it. I have now renewed my Crown Jeep Parts account. If you need any Jeep Parts, let me know. I can get most OEM style replacement parts for the engine, boy and suspension parts. These are the same parts sold by Quadratec. I can beat their prices. Just let me know. Email me with the part numbers you need and I will quote to a price on the Jeep parts you need. I just got a new Yoke for Jenny’s rear differential. Ordered it yesterday afternoon and it is on my desk now. Last week I ordered a Headlight assembly for a friend. She hit a bird on the way home form Florida and busted her headlight on her Jeep Liberty. According to the Fed Ex tracking it was shipped on the 22nd. According to Fed Ex it is still in transit from Texas 8 days later. I did hear about a Fed Ex plane crash. Maybe my package was on that plane. I may be stuck with a headlight Assembly if she decides to get her Jeep fixed somewhere else.